Bhí Adolf Hitler (20 Aibreán 1889 – 30 Aibreán 1945) ina cheannaire (nó Führer) ar an nGearmáin ón mbliain 1933 go dtína bhás sa bhliain 1945. Ba eisean a thosaigh ar an gcogadh ar an bPolainn, rud a chuir tús leis an Dara Cogadh Domhanda, arbh é a thoradh é gur tháinig deireadh lena réimeas féin. Ar dtús, d'éirigh leis post an tSeansailéara, is é sin, an phríomhaireacht, a bhaint amach, agus ansin, chuir sé Acht na gCumhachtaí i bhfeidhm, a chuir ar a chumas an tír a rialú beag beann ar an bparlaimint. Nuair a bhí sé i gceannas ar an tír, bhunaigh sé stát ollsmachtúil nár fhág cead cainte ar bith ag an bhfreasúra, agus bhain sé an chuid ba mhó de na cearta sibhialta de na saoránaigh. Rinne sé géarleanúint chruálach ar a chuid naimhde polaitiúla, ar nós na gCumannach, na nDaonlathach Sóisialta, agus a lán dreamanna eile. Bhí an ciníochas fite fuaite trína shaoldearcadh, ionas nach raibh meas an mhadra aige ar na Giúdaigh ná ar na Slavaigh. D'fhéach sé le Giúdaigh uile na hEorpa a mharú, agus leis an bplean seo—"Fuascailt Dheiridh na Ceiste Giúdaí"—a chur i bhfeidhm, thóg lucht a leanúna campaí géibhinn ar fud na hEorpa leis na Giúdaigh a thachtadh ina sluaite le gás nimhe. Nuair a bhí díormaí an Airm Dheirg ag cúngú air i mBeirlín, chuir sé lámh ina bhás féin in éineacht le boic mhóra eile an pháirtí, go háirithe Joseph Goebbels. Go gairid roimh a bhás, phós sé Eva Braun, a bhí mar leannán aige le fada. Der Führer ina thachrán (timpeall 1891-1892). Tháinig Adolf Hitler chun saoil in Braunau am Inn san Ostair sa bhliain 1889. Is é an ceantar cúngaigeanta tuaithe úd Waldviertel san Ostair Thíos (Niederösterreich) is fód dúchais do mhuintir Hitler. Leaganacha eile den tsloinne chéanna a bhí coitianta sa cheantar is ea Hittler, Hiedler agus Hütler. Bhí Hitler ar an gceathrú páiste den tseisear a saolaíodh d'Alois Hitler agus dá bhean chéile Klara Pölzl. Fuair ceathrar acu bás go hóg. Maidir le ginealas Alois Hitler, is amhlaidh gur leanbh tabhartha a bhí ann a rugadh don chailín aimsire Anna Maria Schicklgruber. Dealraíonn sé gurbh é an feirmeoir Johann Nepomuk Hiedler as Spital in Waldviertel athair Alois, ach nuair a bhí Hitler go díreach ag éirí míchlúiteach mar thuathghríosóir, chuaigh ráflaí timpeall go raibh sinsir Ghiúdacha aige. Níl mórán bunúis leis na scéalta seo, áfach. Is dócha gurbh é an t-iriseoir Hans Habe (János Bekéssy), a chuaigh ag cur seanchas Hitler i dtús na dtríochaidí agus a d'fhoilsigh alt faoi chúlra Hitler i gceann de na nuachtáin i Vín go gairid ina dhiaidh sin, a chuir na scéalta seo ag imeacht. Theastaigh ó Adolf óg dul le healaíontóireacht mar shlí bheatha, rud nár thaitin lena athair ar aon nós, nó bhí seisean ina státseirbhíseach den tseandéanamh, agus ní raibh ciall ar bith aigesean do na healaíona. Fuair an t-athair bás, áfach, sa bhliain 1903, agus ó bhí duine dá thuismitheoirí marbh anois, bhí pinsean beag ag dul d'Adolf ón stát. Sa bhliain 1905, chuaigh Adolf Hitler go dtí Vín, agus é dírithe ar staidéar a dhéanamh ar an bpéintéireacht. Bhí sé ábalta tithe a tharraingt go pointeáilte, ach ní raibh aon lámh aige ar na daoine mar mhóitífeanna. Mar sin, ní raibh ach an dubheitiú ar fáil ó Acadamh na nEalaíon. D'fhan sé i Vín mar sin féin, agus é ag máinneáil thart sa chathair agus ag áitiú air féin go raibh comhábhair an ealaíontóra mhóir ann. D'fhaigheadh sé foscadh oíche sna tithe dídine. 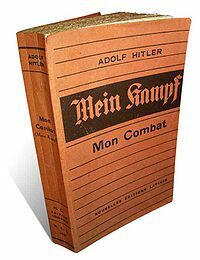 Scríobh sé ina leabhar "Mein Kampf" go raibh sé ar an mblár fholamh ar fad i Vín, ach is dócha go raibh sé ag teacht i dtír go réasúnta ar a phinsean agus ar an airgead a bhí ag teacht óna mháthair. Thairis sin, bhí sé ag líniú pictiúir de thithe agus de radharcraí na cathrach, agus fuair sé cúpla sciúrtóg airgid as na pictiúir seo ó am go ham. Sa bhliain 1907, cailleadh a mháthair le hailse. Chuaigh Hitler go Linz ansin, áit ar fhreastail sé ar an meánscoil roimhe sin. D'fhill sé go Vín sa bhliain 1909. Creidtear gurb ansin a thosaigh a dhearcadh frith-Ghiúdach ag forbairt i gceart, nó ní raibh an frith-Ghiúdachas go ródhona i measc a mhuintire—ba é an fuath ar na Seicigh ba mhó a tháinig uathu siúd. Ba é tionchar Karl Lueger, Ard-Mhéara Vín, ba mhó a chuir i dtreo an fhrith-Ghiúdachais é, chomh maith leis an misteach frith-Ghiúdach Jörg Lanz von Liebenfels. De réir mar a dúirt August "Gustl" Kubizek, an cara ab fhearr a bhí aige san am sin, bhí i bhfad ní ba mhó spéise ag Hitler i gceoldrámaí Richard Wagner ná i bpolaitíocht sna blianta úd. 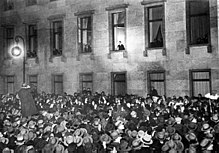 Sa bhliain 1913, fuair Hitler airgead le hoidhreacht a athar, agus chuaigh sé go München sa Ghearmáin. Nuair a thosaigh an Chéad Chogadh Domhanda, liostáil sé in arm na Gearmáine sa Bhaváir. Bhí sé réasúnta cróga mar shaighdiúir, agus bhain sé amach dhá Chros Iarainn ar son a fheabhais i bpáirc an áir. Mar sin féin, ní raibh a chuid comrádaithe ródhoirte dó, ó bhí siad den bharúil go raibh sé róghéilliúil do na hoifigigh. Go gairid roimh dheireadh an chogaidh, chaill Hitler radharc a shúl i ndiaidh ionsaí gás nimhe, mar a dúirt sé féin ina leabhar, agus b'éigean dó seal a chaitheamh in ospidéal míleata i bPasewalk le biseach a fháil. Is é an tuairim atá ag staraithe an lae inniu ar an scéal ná nach raibh ann ach freagairt histéireach a cholainne ar an drochscéala a chuala sé: bhí réabhlóid ar siúl, agus Impireacht na Gearmáine ag tiontú ina Poblacht. Bhí dearcadh coimeádach, nó frithghníomhach fiú, ag Hitler ar chúrsaí polaitíochta na Gearmáine, agus bhain an nuacht seo a leithéid de stangadh as is gur fágadh dall é ar feadh tamaill. An dochtúir ar cuireadh Hitler faoina chúram, ní raibh sé ina speisialtóir ar ghalair na súl, ach ina shiciatraí. Is é an breithiúnas a thug sé ar Hitler gur síceapatach a bhí ann nár chóir ceannasaíocht ar bith a bhronnadh air ná é a chur in áit an údaráis. Mar a bhí na himeachtaí staire le taispeáint, breithiúnas ciallmhar a bhí ann nár tugadh an aird chuí air ina dhiaidh sin, ar mhí-ámharaí an tsaoil. Hitler (ina shuí ar chlé) ina shaighdiúr sa Chogadh Mór. Cuid den fhinscéal polaitiúil a d'insíodh Hitler faoina shaol ina dhiaidh sin ab ea é gur chinn sé, i ndiaidh an tseala a chaith sé ag bisiú i bPasewalk, dul le polaitíocht. Le fírinne, níl sé soiléir an raibh sé leath chomh cinnte faoina thuairimí polaitiúla san am sin, nó go praiticiúil, bhí sé idir eatarthu. D'fhill sé ó Pasewalk go dtína reisimint féin i München, agus é ag iarraidh fanacht sna saighdiúirí. Nuair a tháinig na Sóisialaithe radacacha i seilbh an rialtais áitiúil sa chathair, bhí Hitler sásta bheith ina idirghabhálaí idir an reisimint agus ionadaithe an rialtais sin. Nuair a maraíodh Kurt Eisner, an Sóisialaí Giúdach a bhí ina Phríomh-Aire ar an rialtas radacach sin, d'éirigh ina chogadh dearg sa Bhaváir idir na Sóisialaithe agus na Freikorps, na Saor-Chóir Armtha, cineál "Dúchrónaigh" a raibh dearcadh náisiúnaíoch ón eite dheis acu. I bhfianaise imeachtaí a shaoil ina dhiaidh sin, shílfeá go nglacfadh Hitler páirt ghníomhach sna trioblóidí agus é ag cuidiú leis na Freikorps, ach ní mar a shíltear a bhítear. Le fírinne, tá pictiúirí scannáin fágtha againn ón tréimhse a thaispeánann Hitler ag glacadh páirte i dtionlacan sochraide Eisner—feictear, fiú, suaitheantas na Sóisialaithe air (!). Dealraíonn sé, mar sin, nach raibh sé cinnte go fóill faoin gcineál saoldearcaidh a bheadh aige ina dhiaidh sin. Nuair a bhí na Freikorps i ndiaidh na Sóisialaithe a threascairt, fuair Hitler jab ag oifig riaracháin an Airm i München, ó b'ansin a bhí cuid mhór den chumhacht pholaitiúil san am. Dealraíonn sé gur sceith sé ar iar-chomhshaighdiúirí a raibh bá acu leis an rialtas Sóisialach le dea-mhéin an lucht rialtais nua a bhaint amach dó féin. Ní raibh Arm na Gearmáine, nó an Reichswehr, sásta géilleadh do choinníollacha Chonradh Síochána Versailles, agus mar sin, bhí an tArm ag tacú ar chúla téarmaí le fórsaí rúnda paraimíleata—Schwarze Reichswehr, nó an Reichswehr Dubh. Bhí lucht eagraithe an Schwarze Reichswehr—ina measc Ernst Röhm—ceanúil ar Hitler, agus iad den tuairim go raibh féith an tuathghríosóra ann, ionas go bhféadfadh sé teacht isteach áisiúil ag náisiúnaithe na heite deise. Thug siad an tasc do Hitler súil a choinneáil ar na heagraíochtaí nua polaitiúla a bhí ag teacht ar an bhfód ina scórthaí i München. Ceann de na páirtithe nua polaitiúla ab ea Páirtí Gearmánach na nOibrithe nó Deutsche Arbeiterpartei (DAP). B'iad an t-iriseoir Karl Harrer agus an meicneoir Anton Drexler a bhí i gceannas ar an eagraíocht seo, agus iad ag craobhscaoileadh idéanna seineafóbacha frith-Ghiúdacha agus ag meascadh reitric Shóisialach tríothu. Ar an dóú lá déag de Mheán Fómhair 1919, thug Hitler an chéad chuairt ar chruinniú de chuid an pháirtí seo. Chuala sé duine de na hóráidithe ag éileamh go bhfógródh an Bhaváir neamhspleáchas ar an nGearmáin, agus cháin sé an moladh seo chomh fíochmhar agus chomh deisbhéalach is gur rith le Drexler é a earcú mar bhall. "Dar fia, tá gob ag an bhfear seo a bheidh ag teastáil uainn", ar seisean le Harrer i gcanúint na Baváire. Ó bhí cairde Hitler sa Schwarze Reichswehr sásta leis, liostáil Hitler sa pháirtí mar bhall. Go gairid ina dhiaidh sin, casadh Dietrich Eckart air. Scríbhneoir frith-Ghiúdach a bhí ann, agus é ina bhall den Thule-Gesellschaft, rúnchumann a bhí ag plé le ciníochas agus le rúndiamhrachtaí misteacha. Bhí Eckart ar lorg tuathghríosóra a bheadh ábalta a chuid idéanna a chraobhscaoileadh i measc na mbocht is na nocht. D'aithin sé láithreach gurbh é Hitler an duine a bhí de dhíth air, agus ón lá sin, bhí sé ag tacú is ag cabhrú leis go dílis. Sa bhliain 1920, thosaigh Eckart ag foilsiú an Völkischer Beobachter, nuachtán pháirtí Hitler. Ó bhí Hitler thar barr ag óráidíocht, ní raibh an DAP in ann déanamh ina uireasa, agus bhí a chumhacht sa pháirtí ag méadú. Ba eisean a mhol do na ceannairí eile an páirtí a athainmniú go Nationalsozialistische Deutsche Arbeiterpartei ("Páirtí Sóisialach Náisiúnta na nOibrithe", nó NSDAP). Nuair a d'fhág sé an tArm ar an aonú lá déag is fiche de Mhárta 1920, bhí pá mhaith aige cheana mar óráidí. Sa bhliain 1921, chuaigh Hitler féin i gceannas ar an bpáirtí mar chathaoirleach. Ar an 29 Iúil 1921, tar éis dó ballraíocht iomlán a ghlacadh i bPáirtí Gearmánach na nOibrithe an bhliain roimhe, toghadh Adolf Hitler mar thaoiseach ar an bpáirtí. Tamall de bhlianta ina dhiaidh seo, chum sé an teideal "Der Führer" dó féin, a thabharfaidh údarás dosháraithe dó. Bhí Hitler ina bhoc mór sa pholaitíocht áitiúil anois, ach níor glacadh i ndáiríre é taobh amuigh den Bhaváir. Ó cuireadh deireadh le poblacht shóivéadach Kurt Eisner, bhí München agus an Bhaváir á rialú ag an gCoimeasár Ginearálta Stáit Gustav von Kahr, agus cumhachtaí an deachtóra aige faoi dhlí speisialta. Bhí von Kahr míshásta leis an rialtas poblachtach i mBeirlín, agus é den bharúil gur chóir don Bhaváir slán a fhágáil ag Beirlín agus neamhspleáchas a fhógairt. San am seo, bhí Hitler ag comhoibriú leis an nGinearál Ernst von Ludendorff, a bhí ar an dara fear is airde céim in Arm na Gearmáine sa Chéad Chogadh Domhanda. Bhí Hitler agus Ludendorff den bharúil go mbeadh von Kahr ag teastáil uathu mar chomhghuaillí. Bhí plean acu an chumhacht a shealbhú le lámh láidir i München agus ansin arm dá gcuid féin a earcú le máirseáil go Beirlín agus an rialtas ansin a chur ó chumhacht. Ba é Benito Mussolini a bhí mar réamhshampla acu, nó ba mar sin, a bheag nó a mhór, a chuaigh seisean i gceannas na hIodáile faoin am seo. Bhí na Francaigh i ndiaidh limistéar tionsclaíochta na Gearmáine cois na Réine a fhorghabháil, agus luach an airgid Ghearmánaigh ag titim chomh tiubh is go rabhthas ag caint faoi "bhás an airgid", gan aon trácht a dhéanamh ar na trioblóidí inmheánacha eile sa Ghearmáin. Mar sin, chreid Hitler agus Ludendorff go raibh an t-am oiriúnach le deachtóir a chur i gceannas ar an tír. San am seo, ní raibh Hitler ag iarraidh deachtóireacht a bhaint amach dó féin, ach do Ludendorff, a raibh an-mheas ag cuid mhór de na Gearmánaigh air. Ar an ochtú lá de Mhí na Samhna, 1923, d'ionsaigh Hitler agus lucht a leanúna an teach ólacháin úd Bürgerbräukeller ("Beoirhalla na Saoránach") díreach nuair a bhí von Kahr ag tabhairt óráide ansin. Níor éirigh leis an bplean, áfach. An lá arna mhárach, mháirseáil lucht leanúna Hitler amach agus iad dírithe ar an gcathair a fhorghabháil. Nuair a tháinig siad go dtí an loggia úd Feldherrnhalle ar an Odeonsplatz, fuair siad rompu na péas ón mBereitschaftspolizei. Loisc na póilíní agus na ceannairceoirí a gcuid arm ar a chéile, agus fuair seisear déag de lucht leanúna Hitler bás sa teagmháil, chomh maith le ceathrar póilíní agus duine amháin nach raibh ach ag dul thar bráid. D'éalaigh Hitler ó láthair na n-imeachtaí, ach gabhadh i gceann cúpla lá é.
Cuireadh an dlí ar Hitler agus ar a lucht leanúna, ach ós rud é go raibh "cuspóirí tírghrácha" acu leis an gcoup d'état, ní raibh na breithiúna, a raibh bá acu féin le náisiúnachas den chineál chéanna, róshásta príosúnacht fhada a ghearradh do na cúisithe. D'éigiontaigh siad Ludendorff, ní nárbh ionadh. Ghlac Hitler iomlán na freagrachta air féin, agus mar sin, fuair sé an pionós ba lú a bhí an dlí a bhagairt ar an duine a raibh ardtréas déanta aige, mar atá, cúig bliana príosúnachta. Ní raibh ar Hitler an oiread sin féin a chaitheamh sa phríosún. 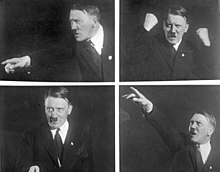 Rud eile fós, níor ruaigeadh Hitler as an nGearmáin, cé gur saoránach Ostarach a bhí ann, agus an dlí ag foráil go ruaigfí aon eachtrannach a mbeadh coir den chineál sin déanta aige. Sa deireadh, níor chaith sé ach conablach bliana i bpríosún Landsberg, agus bhí cead ag daoine de lucht a leanúna cuairt a thabhairt air. Iad siúd a bhí i dteagmháil le Hitler san am sin, fuair siad poist mhaithe ina dhiaidh sin sa Tríú Reich. Sa phríosún a thosaigh sé ag scríobh a leabhair freisin, Mein Kampf. D'fhág Hitler an príosún ar an bhfichiú lá de Mhí na Nollag, 1924. 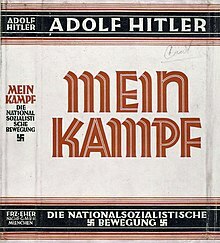 Mein Kampf, an leabhar a scríobh Hitler sna 1920idí. Mar a chonaic muid, bhí Hitler ina shaoránach Ostarach go dtí sin, ach in Aibreán 1925, sheol sé litir chuig na húdaráis Ostaracha ag iarraidh go mbainfí an tsaoránacht sin de, agus fuair sé an achainí seo go sciobtha. I rith an chéad chúpla bliain eile, ní raibh saoránacht aon stáit ag Hitler, agus bhí sé ró-uaibhreach le hiarratas a chur isteach ar shaoránacht na Gearmáine: bhí sé den bharúil gur chóir do stát na Gearmáine an tsaoránacht sin a bhronnadh ar fhear chomh tírghrách leis. Bheadh a leithéid indéanta, dá n-éireodh le baill dá pháirtí a mbeadh céimíocht acu i gcóras an stáit post státseirbhísigh a thabhairt dó, nó bheadh an tsaoránacht ag dul le post den chineál sin. Ní raibh Hitler sásta le gach cineál poist, áfach, nó dhiúltaigh sé dá lán nach raibh sách galánta aige. Sa deireadh thiar, fuair sé post sách ard i mBraunschweig, sa bhliain 1932, agus an tsaoránacht leis. Is follasach nach ndearna sé a dhath riamh le freastal ar dhualgais an phoist. Níor chuir an phróis dlí deireadh ná mórán bac féin le tuathghríosóireacht Hitler. A mhalairt ar fad. Tharraing an phróis súil na tíre go léir air, agus a ainm i mbéal an phobail i dtuaisceart na Gearmáine féin. Chuaigh an clú nua seo i bhfeidhm ar an bhfear féin. Roimhe seo, bhí Hitler den bharúil nach raibh sé ach ag réiteach an róid do cheannaire nua na Gearmáine, cibé cé a bheadh ann - bhí dóchas aige as Ludendorff ar feadh tamaill le haghaidh an phoist sin. Anois, áfach, thosaigh Hitler ag ceapadh go raibh an cheannaireacht sin i ndán dó féin. Ní hionann sin is a rá go mbeadh ag éirí go rómhaith le Hitler nó leis an NSDAP sa pholaitíocht. Bhí saol polaitiúil na Gearmáine ag socrú chun suaimhnis, agus an eacnamaíocht ag bisiú. Mar sin, ní raibh mórán éisteachta ar fáil d'óráidí na náisiúnaithe radacacha. Nuair a d'fhill Hitler ar an tsaoirse, bhí an páirtí imithe le fiántas, go háirithe i dtuaisceart na Gearmáine. Is é sin, tháinig craobh nua den pháirtí ar an bhfód ansin, ach bhí sí á stiúradh ag daoine a ghlac an chuid "Shóisialach" den tSóisialachas Náisiúnta i ndáiríre, agus iad míshásta leis an dóigh a raibh Hitler ag comhoibriú le sean-uasalaicme na sochaí. Ba iad Gregor Strasser agus a dheartháir Otto ba mhó a bhí taobh thiar den fhorbairt seo. Bhí Hitler ábalta "Boilséiveachas náisiúnaíoch" Strasser a chloí agus daoine de lucht a leanúna—go háirithe Joseph Goebbels—a bhréagadh chuige féin, agus i ndiaidh Ard-Fheis an pháirtí i mBamberg sa bhliain 1926, ní raibh aon fhaicsean ná aon chraobh sa pháirtí in ann ceannaireacht Hitler a cheistiú a thuilleadh. I ndiaidh an choup d'état nár éirigh leis, tháinig an tuiscint ag Hitler nárbh í an lámh láidir an dóigh ab fhearr le réabhlóid a chur i gcrích. Ina áit sin, chrom sé ar an daonlathas a chur ar ceal trí bhuntáiste a ghlacadh ar an daonlathas féin. Theastaigh uaidh go mbainfeadh an NSDAP amach suíocháin sa pharlaimint, ach san am céanna, níor theastaigh uaidh go mbeadh an páirtí sásta comhoibriú leis na páirtithe eile. Thairis sin, bhí an NSDAP le bruíonachas a spreagadh sna sráideanna le baint de shíocháin na sochaí. Mar sin, d'fhéadfaí an chuma a chur ar na cúrsaí go raibh an daonlathas ó mhaith mar rud ann féin agus go raibh údarásúlacht de dhíth. Thairis sin, deir saineolaithe áirithe go raibh Hitler ábalta cleasaíocht nua-aoiseach a úsáid i bhfógraíocht an pháirtí, agus gurbh é an gliceas seo a chinntigh rath agus bláth don pháirtí sa deireadh. Bhain Hitler agus an páirtí amach poiblíocht ar fud na tíre nuair a chuaigh siad chun tosaigh ag éileamh reifreann faoi Phlean Young, nach raibh siad sásta leis. Is é an rud a bhí i gceist leis an bplean seo ná scéim a bhí socraithe ag rialtas an tSeansailéara Shóisialaigh Dhaonlathaigh Hermann Müller leis na Meiriceánaigh faoi íocaíocht an chúitimh chogaidh a bhí dlite ón nGearmáin de réir chonradh síochána Versailles. Níor éirigh le Hitler an reifreann a fháil cóirithe, ach murar éirigh, fuair sé tuilleadh tacaíochta i measc na buirgéiseachta náisiúnaíche coimeádaí, agus bhí teagmháil aige le hAlfred Hugenberg, cathaoirleach Pháirtí Gearmánach Náisiúnta an Phobail (Deutschnationale Volkspartei, DNVP), nó páirtí na náisiúnaithe coimeádacha. Mórfhoilsitheoir nuachtán ab ea Hugenberg, agus bhí sé sásta tacaíocht a chuid nuachtán a ghealladh do Hitler. Is é an breithiúnas a bhí aige féin ar an scéal ná gur uirlis mhaith ab ea Hitler le smaoineachas na náisiúnaithe coimeádacha a scaipeadh is a chraobhscaoileadh i measc na cosmhuintire, ach níor chreid sé go bhféadfadh pleananna dá chuid féin a bheith ag Hitler agus iad difriúil ar aon nós ná slí leis na pleananna a bhí ag a leithéidí féin. B'iomaí duine de thacadóirí coimeádacha Hitler a raibh an dearcadh céanna aige. Mar a phointeáil George Orwell amach, bhí coimeádaigh den chineál sin dall ar chomh réabhlóideach agus a bhí an Naitsíochas mar idé-eolaíocht, agus an dímheas a bhí ag na Naitsithe ar na luachanna coimeádacha, ar nós an reiligiúin. Mar sin féin, is dócha nach mbainfeadh Hitler amach an deachtóireacht riamh, murach gur tháinig géarchéim eacnamaíochta na dtríochaidí, an Spealadh Mór nó an Depression, chun fortachta air. Thosaigh an spealadh sa bhliain 1929, agus bhí an Ghearmáin thíos leis thar aon tír eile, beagnach. Ar an 29 Márta 1930, thit comhrialtas na Sóisialach Daonlathach, an pháirtí Chaitlicigh (Zentrum) agus na Liobrálach (nó DDP, Páirtí Daonlathach na Gearmáine) as a chéile, agus an t-easaontas a bhí idir na páirtithe éagsúla faoin dóigh cheart leis an tír a chosaint ar thorthaí an spealta. Ba é an Sóisialach Daonlathach Hermann Müller a bhí ina Sheansailéir ar an nGearmáin san am seo, agus ba é an Seansailéir deireanach a raibh údarás daonlathach aige ó mhuintir na Gearmáine. Nuair a bhí Müller éirithe as, cheap an tUachtarán Paul von Hindenburg an Feisire Caitliceach (is é sin, ball de chuid an pháirtí Zentrum) Heinrich Brüning mar Sheansailéir, agus sa chéad olltoghchán eile, ar an 17 Deireadh Fómhair, mhéadaigh céatadán vótaí na Naitsithe ó 2.6 go 18.3. Roimhe sin, ní raibh ach dhá shuíochán déag acu sa Reichstag, ach anois, tháinig seachtar thar an gcéad acu isteach. Na páirtithe measartha a bhí báúil le bunreacht Weimar, ní raibh tromlach acu a thuilleadh, agus anois, bhí Hitler iompaithe ina bhoc mór i bpolaitíocht na Gearmáine. Bhí Hitler ag fáil airgid ó dheontóirí éagsúla, cosúil leis na hElbjunker (is é sin, tiarnaí talún in oirthear na Gearmáine, sa Phrúis), leo siúd a bhí ag dréim leis an Impire a chur ag rialú na Gearmáine arís, le gróintíní móra eacnamaíochta, le lucht míleata (go háirithe sean-Óglaigh na bhFreikorps) agus, fiú, le daoine aonair sna tíortha Angla-Mheiriceánacha a raibh dáimh acu leis agus lena chuid polasaithe. Thairis sin, bhí an Spealadh Mór ina chuidiú mór dó, ó bhí sé ag cur le héagobhsaíocht pholaitiúil Phoblacht Weimar, nach raibh an daonlathas róláidir inti riamh. 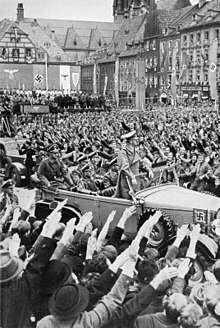 Hitler ag fuinneog an Reichskanzlei (Seansailéireacht an Reich) in oíche an oirnithe aige mar Sheansailéir, 30 Eanáir 1933. Níor bhain Hitler amach saoránacht na Gearmáine ach i Mí Feabhra 1932, ach nuair a bhí sé ina Ghearmánach go hoifigiúil, bhí cead iarrthóireachta aige i dtoghcháin Uachtaránachta na bliana céanna. Ba é an seanmharascal cogaidh Paul von Hindenburg a ghnóthaigh an báire sin, ach bhí Hitler go tiubh sna sálaí aige, agus b'éigean athvótáil a chóiriú, toisc nach bhfuair aon duine de na hiarrthóirí a dhóthain vótaí sa chéad bhabhta. I Mí na Samhna, 1932, chuaigh na Gearmánaigh chuig an mbosca ballóide in athuair, áfach, agus olltoghchán nua ar siúl. An uair sin, b'iad na Naitsithe an páirtí ba mhó sa Pharlaimint, agus ar an 30ú lá de Mhí Eanáir 1933, cheap an tUachtarán Hindenburg Adolf Hitler mar Sheansailéir. Na coimeádaigh agus na míleataigh timpeall ar Hindenburg, bhí siad ag áitiú ar an Uachtarán rialtas náisiúnaíoch a cheapadh agus Hitler a chur ina cheannas. Bhí tacaíocht ag teacht do Hitler i gcónaí ó na gróintíní tionsclaíochta agus ó na baincéirí, nó bhí siad den bharúil gurbh eisean an sciath chosanta ab fhearr ar na Cumannaigh. Thairis sin, má bhí Hitler ag gealladh atharmáil na tíre, b'ionann sin agus an tionsclaíocht a chur ag táirgiú treallamh cogaidh don Stát, agus ar ndóigh, ba díol spéise é sin do na gróintíní. Bhí claontachtaí áirithe taobh istigh den NSDAP féin chun frithchaipitleachais, ach má bhí, bhí éirithe le Hitler iad a choinneáil faoi smacht, rud a thaitin go mór le lucht an rachmais, ní nárbh ionadh. B'fhearr le Hitler, ar ndóigh, an milleán a fhágáil ar na Giúdaigh, seachas ar na rachmasóirí. In óráid a thug sé do Chlub Tionsclaíochta Düsseldorf sa bhliain 1932, mhol Hitler na scothaicmí caipitleacha, agus é ag rá nach dtiocfadh rath ná bláth ar eacnamaíocht na Gearmáine choíche, dá mbeadh "duine as gach beirt den tuairim gurb ionann rachmas agus gadaíocht"—tagairt a bhí anseo do na Daonlathaigh Shóisialta agus do na Cumannaigh. Na coimeádaigh náisiúnaíocha, arís, chinntigh Hitler a dtacaíocht siúd dó féin nuair a ghlac sé le Franz von Papen mar Leas-Sheansailéir. Bheadh cead ag Papen bheith i láthair agus an Seansailéir ag dul i bhfianaise an Uachtaráin. Shíl von Papen féin go mbeadh sé in ann "srianta a choinneáil le Hitler" ar an dóigh seo. Bhí dóchas ag na míleataigh go dtreiseodh Hitler leis na fórsaí armtha agus go gcuirfeadh sé Conradh Versailles ar ceal. Maidir leis na coimeádaigh náisiúnaíocha, bhí siadsan ag dréim le tuilleadh cobhsaíochta i saol polaitiúil na tíre agus le cultúr polaitiúil nua a bheadh níos cairdiúla i leith na monarcachta. San oíche idir an 27ú agus an 28ú lá de Mhí Feabhra 1933, chuaigh áras an Reichstag—is é sin, áras na Parlaiminte—trí thine. An fear a rinne é, mar atá, an tOllannach Marinus van der Lubbe, bhí barúlacha aige a raibh cuma éigin na heite clé orthu, cé gur fear mire ann a bhí thar aon rud eile. Mar sin féin, is é an chiall a bhain na Naitsithe as an scéal gur sceimhlitheoir Cumannach a bhí ann, agus iad ag éileamh cumhachtaí speisialta le feachtas sceimhlitheoireachta an Idirnáisiúntáin Chumannaigh a stopadh. D'áitigh Hitler ar an Uachtarán Hindenburg na dlíthe éigeandála a chur i bhfeidhm, rud a chuir ar chumas an tSeansailéara na cearta sibhialta bunaidh a chur ar ceal. Ní fhéadfaí na dlíthe éigeandála a choinneáil i bhfeidhm ach go sealadach, agus theastaigh ó Hitler dlíthe seasta den chineál chéanna a reachtú. Chuaigh sé i dtuilleamaí a chuid lucht leanúna sna póilíní agus sna fórsaí slándála leis na Cumannaigh agus le cuid de na Sóisialaigh Dhaonlathacha a eisiamh as an bParlaimint, le go bhféadfadh sé tromlach dhá dtrian a chinntiú dó féin agus dá chuid dlíthe speisialta. Bhí na páirtithe neamh-Shóisialacha sásta a vótaí a chaitheamh i bhfách leis na dlíthe speisialta a bhronn cumhachtaí neamhghnácha ar Hitler (Ermächtigungsgesetze nó dlíthe cumhachtaithe a thugtaí orthu as Gearmáinis). Nuair a chuaigh na dlíthe seo um chumhachtaí speisialta do Hitler i bhfeidhm, tháinig deireadh le daonlathas Phoblacht Weimar, agus thosaigh ré na deachtóireachta, nó ré an Tríú Reich. Seo sliocht as comhrá idir Hitler agus Martin Bormann, ar 21 Bealtaine 1942. Tá Hitler ag cuimhneamh siar ar na heachtraí a tharla sular ceapadh ina Sheansailéir é ar an 30 Eanáir 1933. "Bhí ardteannas polaitiúla ann nuair a dhiúltaigh mé glacadh leis an Leas-Seansailéireacht i gcomh-aireacht von Papen i Lúnasa 1932 agus nuair a rinne Schleicher agus Strasser iarracht an aontacht láidir a bhí sa Pháirtí Naitsíoch a scoilteadh i Mí na Nollag 1932. Rinne an tUachtarán Hindenburg, trí idirghabhálaí von Papen teagmháil liom. Ghlac mé páirt sna hidirbheartaíochtaí seo mar shíl mé go raibh sé ríthábhachtach go rachainn i mbun na Seansailéireachta go dlisteanach. Is mar Sheansailéir a bheadh tofa go dlisteanach amháin a thiocfadh liom na páirtithe polaitiúla uilig eile a bhí ag cur i mo choinne a chloí agus coimhlint ar bith leis an Arm sa todhchaí a sheachaint. Má thug gróintíní na heacnamaíochta agus na tionsclaíochta tacaíocht do Hitler go saorthoilteanach roimhe seo, b'éigean dóibh, anois, tuilleadh den earra chéanna a thál air ina n-ainneoin féin. 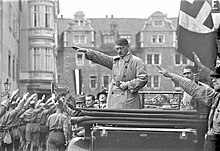 Ar an chéad lá de Mhí an Mheithimh sa bhliain 1933, tugadh isteach an t-Adolf-Hitler-Spende, is é sin, an "bronntanas" ar Hitler. Chaithfeadh gach gnóthas nó comhlacht "bronntanais" den chineál seo a thabhairt do pháirtí na Naitsithe feasta, agus iad áirithe i gcoibhneas líon an lucht oibre a bhí ag gach gnólacht agus an oiread tuarastail a d'íoctaí leo. Idir seo agus an bhliain 1945, bhailigh páirtí na Naitsithe seacht gcéad milliún Reichsmark ar an dóigh seo, agus bhí saol an mhadra bháin ag na Naitsithe ar an ailp seo, gan aon agó. Ba é Ernst Röhm an t-aon duine amháin a bhí in aon neasacht do bheith ábalta ollchumhacht Hitler a cheistiú faoin am seo. Ní raibh aon duine eile ag tabhairt Du in áit an cheiliúir fhoirmiúil úd Sie ar Hitler, agus thairis sin, d'fhéadfá a rá go raibh Hitler faoi chomaoin ag Röhm, a chuidigh go mór leis nuair nach raibh sé i mbéal an phobail go fóill. Bhí go leor daoine sa Pháirtí a bhí ag iompairc le Röhm faoi ghnaoi Hitler, cosúil le Heinrich Himmler, Hermann Göring agus Reinhard Heydrich, agus iad uile ag tabhairt le fios don deachtóir nach raibh Röhm iontaofa. Ar an 30ú lá de Mhí an Mheithimh, 1934, "Oíche na Scian Mór", phurgaigh Hitler a pháirtí. Maraíodh Röhm agus ceannairí eile an SA, chomh maith le sraith de ghinearáil agus daoine eile nach raibh ag taitneamh le Hitler ar chúis éigin. Cuid acu, bhí siad dáiríribh ag cur in aghaidh Hitler, ach ní raibh sa chuid eile ach Naitsithe dílse nó náisiúnaithe coimeádacha a fuair Hitler riachtanach a chur chun báis ar eagla na heagla. Mar shampla, maraíodh an Ginearál Kurt von Schleicher agus a bhean chéile, toisc go raibh von Schleicher féin ina Sheansailéir tráth, roimh lá Hitler. I ndiaidh bhás Hindenburg ar an dara lá de Mhí Lúnasa sa bhliain 1934, chuir Hitler ar na fórsaí armtha mionnaí dílseachta a mhóidiú dó féin, agus ón lá sin amach, bhí sé ina Cheannaire agus ina Sheansailéir araon—is é sin, Führer und Reichskanzler. I Mí Eanáir 1938, cuireadh Werner von Blomberg, arbh é an tAire Cogaidh é, agus an Ginearál-Choirnéal Werner von Fritsch, Ard-Cheannasaí an Chos-Slua, as oifig. Ba é an SS a tharraing callán orthu. Maidir le Blomberg, cuireadh bean óg, Erna Gruhn, in aithne dó a bhí ina hiar-striapach agus ina hiar-chuspa d'irisí pornagrafaíochta. Thit Blomberg i ngrá leis an gcailín, cé gur fear cnagaosta a bhí ann cheana féin, agus phós sé í. Ar dtús, ní raibh Hitler ná Göring míshásta ar aon nós ná slí le scéal grá an Ghinearáil, cé go bhfuil a mhuintir-sean ar an daoraí faoin bpósadh. A mhalairt ar fad, thug Hitler agus Göring in iúl do Bhlomberg gur dea-shiombail d'aontas nua na Gearmáine a bheadh ann dá bpósfadh ginearál de phór uasal cailín simplí cosúil le hErna. Níor tháinig fíor-scéal Erna chun solais ach i ndiaidh na bainise, agus ansin, bhí port Bhlomberg seinnte mar mhíleatach proifisiúnta. Maidir le Fritsch, arís, cuireadh ina leith go raibh sé ina homaighnéasach. Mar sin, d'éirigh le Hitler ceannasaithe an Airm a náiriú agus a chur as oifig, agus ina dhiaidh sin, bhí sé féin i gceannas na bhfórsaí armtha chomh maith leis an stát sibhialta. Spreagadh tábhachtach do pholasaithe Hitler ab ea an frith-Ghiúdachas a bhí meáite ar na Giúdaigh a mharú scun scan, chomh maith le leagan radacach den Darwineachas sóisialta. Ón chéad lá ar tháinig sé os comhair an tsaoil mhóir go dtí lá a bháis, ba nós le Hitler na Giúdaigh agus na "ciníocha ar bheagán fiúntais" a ionsaí ina chuid óráidíochta. Ciníocha ar bheagán fiúntais ab ea na Giofóga, na Polannaigh agus na Rúisigh, mar shampla. Maidir leis an Darwineachas sóisialta, tháinig sé chun solais ina chuid cainteanna faoi dhaoine a raibh galar, máchail nó easláinte orthu, agus é ag rá gur "beatha neamhfhiúntach" (lebensunwertes Leben) a bhí i gceist leo. Is é an dearcadh a bhí ag Hitler ar stair an chine dhaonna nach raibh ann go bunúsach ach síorchath ina raibh na dea-chiníocha agus an bheatha fhiúntach ag díothú na ndroch-chiníocha agus na beatha neamhfhiúntaí. Mar shampla, dúirt sé ag Ard-Fheis a pháirtí i Nürnberg sa bhliain 1929: "Dá saolófaí milliún leanbh don Ghearmáin in aghaidh na bliana, agus 700,000-800,000 duine den chuid is laige á ndíothú san am céanna, is féidir gur méadú ar ár bhfórsaí a bheadh ann". Ar dtús, tháinig frith-Ghiúdachas Hitler agus na Naitsithe chun solais sa dóigh a ndéantaí leatrom oscailte ar na Giúdaigh, agus a gcuid cearta sibhialta á mbaint díobh. Le linn an Dara Cogadh Domhanda, chuaigh an polasaí sin chun géaradais nuair a tosaíodh ar na Giúdaigh a mharú ina sluaite—an tUileloscadh, mar a thugtar air. Bhí sé tugtha le fios ag Hitler ina leabhar Mein Kampf gur theastaigh uaidh na Giúdaigh go léir a chur de dhroim an tsaoil, mar "fhuascailt dheiridh" ar an "gceist Ghiúdach". Áirítear go raibh timpeall ar shé mhilliún Giúdach ar feadh na hEorpa thíos leis an bhfeachtas ollscriosta seo. Go gairid i ndiaidh do Hitler teacht i gcumhacht, tosaíodh ag imirt leatroim ar na Giúdaigh go fairsing. I Mí Aibreáin na bliana 1933, d'eagraigh an rialtas nua baghcat trí lá ar na siopaí Giúdacha. Is é an t-ábhar a luaigh siad leis an mbaghcat ná go raibh "na Giúdaigh sa choigríoch ag scaipeadh scéalta uafáis" faoin nGearmáin. Sna sálaí ag an mbaghcat, reachtaíodh dlíthe agus achtanna nua le tuilleadh srianta a chur le cearta daonna na nGiúdach agus le saoránaigh den dara grád a dhéanamh díobh. Mar shampla, na Giúdaigh a bhí ina státseirbhísigh, chaill siad a gcuid post i ndiaidh dlí nua, agus cuireadh isteach ar na Giúdaigh a raibh jabanna de chineál eile acu freisin. Ní raibh cead ag na dochtúirí Giúdacha, mar shampla, ach othair Ghiúdacha a leigheas, agus ní fhéadfadh na dlíodóirí Giúdacha freastal ach ar chliaint Ghiúdacha. Sa bhliain 1935, reachtaíodh "Dlíthe Nürnberg" a bhain na cearta sibhialta de na Giúdaigh go deifnideach. Thar aon rud eile, toirmisceadh ar na Giúdaigh daoine neamh-Ghiúdacha a phósadh nó comhriachtain ghnéis a bheith acu leo. Chabhródh an stát agus an páirtí le gnóthadóirí neamh-Ghiúdacha gnóthais Ghiúdacha a shealbhú. Na Giúdaigh a bheadh le dul ar imirce, chaithfeadh siad cáin ard a íoc, i gcruth is nach mbeadh pingin rua acu agus iad ag cromadh ar an saol nua thar lear. Roimh an Uileloscadh féin, b'í Oíche na Gloine Briste (Reichskristallnacht) ón naoú go dtí an deichiú lá de Mhí na Samhna 1938 buaicphointe na géarleanúna. Rinneadh ionsaithe ar na Giúdaigh, ar a gcuid gnóthas, sionagóg agus fothuithe eile de réir mar a d'eagraigh Joseph Goebbels, an tAire Bolscaireachta, iad, agus é ag fógairt san am céanna gurbh í "fearg spontáineach an phobail" ba chúis leis na hionsaithe. I ndiaidh don Dara Cogadh Domhanda pléascadh amach, ní ghabhfadh Hitler leor le gnáth-ghéarleanúint na nGiúdach a thuilleadh—theastaigh uaidh iad a mharú agus a dhíothú go fisiciúil. Ní raibh cead eisimirce ag na Giúdaigh a thuilleadh, agus de réir mar a bhí trúpaí na Gearmáine ag forghabháil tíortha eile, bhí géarleanúint na nGiúdach ag dul i bhfairsinge. Ón chéad lá de Mhí Mheán Fómhair 1941 i leith, chaithfeadh na Giúdaigh go léir, a bhí ní ba sine ná sé bliana d'aois, an réalta bhuí a fhuáil dá gcuid éadai ionas go mbeadh sí le feiceáil go héasca. Cuireadh srianta éagsúla le saol na nGiúdach. Ní raibh cead acu dul ar bhord na mbusanna, ná gluaisteán, raidió nó fiú madra nó cat a bheith acu. De réir a chéile, chaithfidís a seantithe agus a seanárasáin a thréigean le haghaidh a thabhairt ar na geiteonna agus na campaí géibhinn. Sa bhliain 1942, tógadh na chéad champaí díothúcháin sa Pholainn, a bhí forghafa ag na díormaí Gearmánacha: Auschwitz-Birkenau agus Majdanek. Sna campaí díothúcháin, bhí na daoine á marú mar a bheadh tionsclaíocht ann, is é sin, b'éigean dóibh dul isteach i seomraí gáis inar tachtadh iad le hidriginchiainíd ("aigéad Prúiseach", "Zyklon B"). Níorbh iad na Giúdaigh amháin a bhí á marú iontu, ach Polannaigh Chaitliceacha—intleachtóirí ach go háirithe, nó níor theastaigh ó Hitler aos léinn dá gcuid féin a fhágáil ag na náisiúin Shlavacha—agus Giofóga, ach go háirithe. Iad siúd atá ag iarraidh an tUileloscadh a shéanadh, tá siad ag áitiú nach féidir Hitler a chiontú san Uileloscadh, ós rud é nár thángthas trasna ar aon doiciméad oifigiúil ina mbeadh Hitler féin ag ordú go ndíothófaí na Giúdaigh, doiciméad a bheadh sínithe ag an deachtóir. Ón taobh eile de, tá sé soiléir go hiomlán go raibh an cinedhíothú ag freagairt dá mhianta pearsanta. Luaigh sé cinedhíothú na nGiúdach ina leabhar Mein Kampf, ag tabhairt le fios gur shíl sé gur cuidiú le cás na Gearmáine sa Chéad Chogadh Domhanda a bheadh ann dá gcuirfí na Giúdaigh chun báis san am sin, agus in óráid a thug sé don Pharlaimint (Reichstag) ar an 30ú lá de Mhí Eanáir 1939, bhagair sé go gcuirfeadh sé "cine na nGiúdach san Eoraip de dhroim an tsaoil" dá mbeadh cogadh ann. De réir mar ba chuimhin le Heinrich Himmler, d'ordaigh Hitler go pearsanta in Earrach na bliana 1941, agus é dóchasach i gcónaí go mbeadh an lá ag an nGearmáin, go marófaí na Giúdaigh go léir. Dúirt Himmler lena shuathaire pearsanta, Felix Kersten, san am céanna, roimh an ionsaí ar an Aontas Sóivéadach, nár mhór "na Giúdaigh, gach aon duine acu, a dhíothú roimh dheireadh an chogaidh. Sin é an rud atá ag teastáil ón bhFührer". Sa bhliain 1943, nuair a bhí breithlá an deachtóra á cheiliúradh, thug Himmler óráid do cheannairí an SS agus iad cruinnithe i bPosen (Poznań sa Pholainn), agus é ag trácht go hoscailte ar an Uileloscadh agus ar an dóigh a gcuirfí i gcrích é. Is éadócha go ndéanfadh sé a leithéid gan faomhadh soiléir a fháil roimh ré ón bhFührer. Thairis sin, tá tuairiscí ann ó dhaoine a bhí i bhfianaise Hitler nuair a bhí sé ag tagairt do mhionsonraí an Uilelosctha. Dúirt a ghiolla Heinz Linge agus a aidiúnach Otto Günsche go gairid i ndiaidh an chogaidh go raibh spéis mhór aige sna seomraí gáis agus sa dóigh a n-oibrítí iad. Chuireadh Himmler mionsamhlacha agus gormchlónna de na campaí báis faoina bhráid, agus d'ordaigh Hitler "iomlán an scóid" a ligean leis na dearthóirí. Más deacair féin milleán Hitler san Uileloscadh a dhearbhú, níl aon amhras ann go raibh sé ciontach go pearsanta i gcoir mhór eile de chuid na Naitsithe. I Mí Dheireadh Fómhair sa bhliain 1939, shínigh sé an t-ordú le "scéim T4", mar a thugtar uirthi, a chur i gcrích. Mar sin, chuir sé ar chumas na ndaoine a bhí i mbun na scéime daoine a mharú a bhí easlán ó thaobh an choirp nó na hintinne de, nó "daoine nárbh fhiú a fhágáil ina mbeo" (lebensunwertes Leben), mar a deirtí i mbéarlagair na hidé-eolaíochta. "Eotanáis" nó bás faoisimh a thugtaí ar an dúnmharfóireacht seo go hoifigiúil. Ba le Philipp Bouhler, a bhí i gceannas ar oifig phearsanta Hitler i bpáirtí na Naitsithe (Führerkanzlei), a thit sé scéim na heotanáise a thabhairt i gcrann. D'iompaigh sé tithe téarnaimh agus banaltrais ina dtithe báis. Sa Ghearmáin féin, maraíodh beagnach 190 000 duine a raibh máchail éigin orthu—titimeas, mar shampla. Tachtadh cuid acu le gás cosúil leis na cimí sna campaí géibhinn, cuid eile tugadh nimh de chineál eile dóibh, bhí dornán ann a lámhachadh scun scan, agus fágadh dream eile fós gan bia go dtí go bhfuair siad bás le hocras. Is deacair a fháil amach, cé mhéid a básaíodh ar an dóigh seo sa chuid den Eoraip a bhí forghafa ag na trúpaí Gearmánacha. Fuair eaglaisigh sa Ghearmáin amach faoi scéim na heotanáise agus cháin siad í go poiblí—is fiú Clemens August von Galen, easpag Caitliceach Münster, a ainmniú mar dhuine acu—agus b'éigean don SS tuilleadh rúndachta a chleachtadh leis an scéim a leanúint. I ndeireadh an chogaidh, bhí duine as gach beirt de na heasláin sna tithe banaltrais agus téarnaimh curtha chun báis. Ócáid oiliúna ab ea scéim na heotanáise do thascfhórsaí an SS le haghaidh an ródaigh a bhítí a ullmhú do na Giúdaigh. Cosúil le polaiteoirí daonlathacha Phoblacht Weimar féin, bhí Hitler ag iarraidh conradh síochána Versailles a athbhreithniú nó a chur ar ceal. Murab ionann agus iad siúd, áfach, ní raibh sé sásta le canálacha na taidhleoireachta amhán, — chuir sé an cogadh san áireamh chomh maith. Ní raibh an cogadh ar an gclár oibre go fóill, nó bhí na cumhachtaí Eorpacha eile sásta a lán a ghéilleadh do Hilter. Mar shampla, shínigh an Bhreatain Mhór an Conradh Angla-Ghearmánach um Chúrsaí Cabhlaigh leis an nGearmáin, agus shocraigh an Pholainn conradh neamhionsaithe leis na Gearmánaigh sa bhliain 1934. Sa bhliain chéanna, d'ardaigh an Ghearmáin an buiséad cogaidh thar na srianta a cuireadh leis i gconradh síochána na bliana 1919, agus dhá bhliain ina dhiaidh sin, chuaigh Hitler chun diúnais ar an gconradh síochána arís, nuair a ghabh fórsaí na Gearmáine na tailte dí-mhíleataithe taobh thiar den Réin. Go dtí sin, ní raibh cead isteach ag an arm Gearmánach sa chuid sin den tír. Cé go raibh an Ghearmáin ag sárú an chonartha glan oscartha leis an gcineál seo gníomhartha, níor tharraing na cumhachtaí eile aon challán. Níor ghabh Hitler leor le hathbhreithniú Chonradh Versailles amháin, nó bhí sé inbharúla go raibh, fiú, teorainneacha na Gearmáine roimh an Chéad Chogadh Domhanda róchúng don náisiún. Cé go raibh sé ag cur béime ar an tsíocháin ina chuid óráidíochta, bhí sé ag ullmhú cogaidh cheana féin. 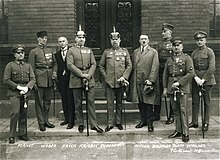 Nuair a fuair an sean-Uachtarán Hindenburg bás sa bhliain 1934, chuir Hitler in iúl dá chuid ginearál go raibh sé meáite an Ghearmáin a dhéanamh inniúil chun cogaidh sula mbeadh cúig bliana thart. Leis an gcuspóir seo a bhaint amach, chuir sé an coinscríobh i bhfeidhm arís sa bhliain 1935, agus an bhliain a bhí chugainn d'fhógair sé plean ceithre mblian chun treisiú leis na fórsaí armtha. Bhí athbheochan eacnamúil na Gearmáine ón mbliain 1933 ar aghaidh go mór mór i dtuilleamaí scéimeanna stáit le hobair a sholáthar, scéimeanna a bhí bunaithe ar an tseirbhís éigeantach oibre (Arbeitsdienst) agus ar an téisclim chogaidh. Bhí meáiteacht Hitler i gcúrsaí an pholasaí eachtraigh le haithint ó Mhí Dheireadh Fómhair na bliana 1933 amach, nuair a d'éirigh an Ghearmáin as na comhchainteanna dí-armála leis an mBreatain Mhór agus leis an bhFrainc. San am céanna, d'fhág an Ghearmáin slán ag Conradh na Náisiún chomh maith. Sa bhliain 1934, dhúnmharaigh na Naitsithe áitiúla Seansailéir na hOstaire Engelbert Dollfuss, agus tacaíocht acu ó Hitler, nó bhí siad ag iarraidh teacht i gcumhacht san Ostair agus an tír a nascadh leis an nGearmáin, scéim nár éirigh léi go fóill san am sin. Cosúil leis sin, bhí Hitler ag tacú le Franco i gCogadh Cathartha na Spáinne ón mbliain 1936 ar aghaidh. Cuidiú tábhachtach ab ea é le Franco na heitleáin Ghearmánacha—"Léigiún na gCondar"—a chuir Hitler go dtí an Spáinn, ach is dócha gurbh é an cleachtadh cogaidh dá chuid eitleoirí ba mhó a bhí ag teastáil ón deachtóir Gearmánach. Ar an gcúigiú lá de Mhí na Samhna 1937, chuir Hitler na ginearáil in eolas a chuid pleananna cogaidh. Dúirt sé go hoscailte "gurbh é an cogadh an t-aon fhreagra ar cheist na Gearmáine", agus é ag tabhairt le tuiscint go gcaithfí an chéad seans eile a thapú leis an tSeicshlovaic agus an Ostair a ghabháil. I Mí na Márta 1938, d'éirigh le Hitler an Ostair a iompú ina cúige Gearmánach, "Ostmark" ("Na Críocha Thoir") mar a baisteadh uirthi. Maraíodh an deachtóir, Engelbert Dollfuss, ceithre bhliain roimhe. I Mí Dheireadh Fómhair, d'éiligh sé go dtabharfadh an tSeicshlovaic na tailte in aice leis an teorainn—Sudeten—don Ghearmáin, ós rud é gur Gearmáinis ba mhó a bhí á labhairt ag muintir na gcríoch seo. Ós rud é go raibh conradh comhghuaillíochta ag an tSeicshlovaic leis an bhFrainc agus le Sasana, bhí cogadh ag bagairt san am sin féin. Bhí Mussolini inbharúla nach raibh an Iodáil ullamh don chogadh go fóill, agus chuaigh seisean ag déanamh idirghabhála. 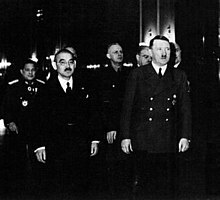 Dá thoradh sin, tháinig Príomh-Airí na Breataine Móire agus na Fraince, Neville Chamberlain agus Édouard Daladier, go München le haghaidh comhchainteanna le Hitler. Ní raibh siadsan den tuairim, ach an oiread, go mbeadh a dtíortha in ann ag an gcogadh, agus mar sin, bhí siad géilliúil d'éilimh Hitler. Mar sin, d'fhág siad cead aige na críocha ag an teorainn a ghabháil. Cé gur chuir Hitler urra le slándáil na Seicshlovaice, ní raibh sé mall ag briseadh a ghealltanais. I Mí na Márta 1939, chuir sé deireadh leis an tSeicshlovaic mar thír neamhspleách. Chuidigh sé leis na náisiúnaithe Slóvacacha a leath féin den tír a iompú ina "stát neamhspleách" faoi choimirce na Gearmáine—le fírinne, ní raibh an stát seo neamhspleách ar an nGearmáin ar aon nós. An chuid eile den tSeicshlovaic, hiompaíodh ina "coimirceas" í, is é sin, níor fágadh oiread is cuma an neamhspleáchais uirthi. Nuair a bhí an tSeicshlovaic curtha de dhroim an tsaoil, dúirt Hitler in óráid a thug sé don Reichstag go raibh a dóthain tailte ag an nGearmáin anois. Mar sin féin, cúpla mí ina dhiaidh sin, thosaigh sé ag éileamh go gcuirfí Danzig leis an nGearmáin—san am sin, bhí an chathair seo ina Saor-Chathair a raibh stádas an stáit neamhspleách aici. I Mí Lúnasa 1939, shínigh sé conradh—Conradh Ribbentrop agus Molotov—leis an Aontas Sóivéadach inar socraíodh go mbeadh iarthar na Polainn ag titim leis an nGearmáin dá gcuirfí "cuma nua ar na tíortha" in Oirthear na hEorpa. Nuair a chuaigh sé ag éileamh a chuid féin den Pholainn, phléasc an Dara Cogadh Domhanda amach. Ar an gcogadh seo a bhí sé meáite ón lá ar tháinig sé i gcumhacht sa Ghearmáin. An dóigh ar iompair sé é féin ón gcruinniú mullaigh i München ar aghaidh, áfach, chuaigh sé i gcion ar lucht rialtais na Fraince agus na Breataine Móire nárbh fhéidir muinín a bheith agat as Hitler. Dá dtabharfá dó an rud a bhí ag teastáil uaidh, ní bheadh sé i bhfad ag éileamh tuilleadh. I mbreis ar dhíothú na nGiúdach, ní raibh ach aon chuspóir amháin eile ag Hitler, agus é luaite aige i Mein Kampf cheana féin, is é sin, cumhacht dhomhanda a dhéanamh den Ghearmáin. Ós rud é nach mbeadh ceachtar den dá chuid ar fáil gan an lámh láidir, bhí an cogadh ar na bacáin ó thús a dheachtóireachta. Ní raibh sé ag iarraidh na teorainneacha ó na laethanta roimh an Chéad Chogadh Domhanda a chur i bhfeidhm arís, nó bhí rud ba mhó ná sin uaidh, mar atá, Oirthear na hEorpa a choilíniú mar "spás maireachtála" (Lebensraum) don Ghearmáin. Ba é an tAontas Sóivéadach ba mhó a bheadh thíos leis na scéimeanna seo. Bhí sé ábalta an cuspóir seo a chur i bhfocail mar "chath in aghaidh an Bhoilséiveachais", rud a chabhraigh leis tacaíocht a mhealladh ó pholaiteoirí Iartharacha a raibh eagla orthu roimh an gCumannachas. Níor thuig ceannairí Shasana agus na Fraince ach i ndiaidh ghabháltas Hitler ar an tSeicshlovaic nach raibh an cogadh in aghaidh na Gearmáine inseachanta. Thosaigh siad ag caitheamh tuilleadh airgid le téisclim chogaidh, agus iad ag iarraidh comhoibriú éigin a chur ar bun leis an Aontas Sóivéadach, ó shíl siad gurbh é an comhghuaillí nádúrtha é i gcoinne Hitler. Ní raibh cuidiú ag teacht ó Stailín, áfach. Bhí Stailín agus a Aire Gnóthaí Eachtracha, Vyacheslav Molotov, barúlach go raibh cabhair an Aontais Shóivéadaigh ag teastáil ó Shasana agus ón bhFrainc níos géire ná a mhalairt. Bhí Stailín den tuairim, fosta, go mbeadh cogadh fada tuirsiúil le cur san Iarthar, cosúil le cogadh na dtrinsí le linn an Chéad Chogadh Domhanda, agus go bhféadfadh sé a ladar a chur i gcúrsaí na hEorpa nuair a bheadh na cumhachtaí eile i ndeireadh a bpéice. Thairis sin, bhí am de dhíth air leis an Arm Dearg a atheagrú, ó bhí sé ina phraiseach i ndiaidh na bpurguithe, agus cuid mhór de na ginearáil curtha chun báis le paranóia Stailín a shásamh. Molotov ag síniú an socrú neamhionsaithe idir na Naitsithe agus na Rúisigh i Moscó ar an 23 Lúnasa 1939, le Joachim von Ribbentrop agus Stailín taobh thiar de. Bhí a lán le gnóthú ag Stailín agus ag Hitler ar an gcomhoibriú sealadach, agus ar ndóigh, cé go raibh an chuma ag teacht ar an scéal nach mbeadh cogadh eatarthu inseachanta, theastaigh uaidh é a chur ar fionraí a fhad agus ab fhéidir. Bhí Hitler ag iarraidh cogadh an dá chathéadan a sheachaint agus an Fhrainc is Sasana a chloí sula dtabharfadh sé aghaidh ar an Rúis. Mar sin féin, tháinig sé aniar aduaidh ar an saol mór ar fad nuair a shínigh Joachim von Ribbentrop, Aire Gnóthaí Eachtracha na Gearmáine, conradh neamhionsaitheach leis na Sóivéadaigh ar an 23ú lá de Mhí Lúnasa sa bhliain 1939. Bhí sé leagtha amach in iatán rúnda an chonartha seo go ndéanfadh an Ghearmáin agus an tAontas Sóivéadach deighilt ar Oirthear na hEorpa eatarthu dá dtarlódh "atheagrú na dtailte is na dteorainneacha" ansin. Anois, agus é ina mhuinín nár bhaol dó ionradh Sóivéadach ar bith, bhí deis ag Hitler cogadh a chur ar an bPolainn, ar an bhFrainc agus ar an Ríocht Aontaithe. Nuair a bhí an conradh sínithe, ba léir do chách go raibh an cogadh ag teacht. Go gairid ina dhiaidh sin, thosaigh Hitler ag éileamh ar an bPolainn go dtabharfadh sí uaithi na tailte a dtugtaí "Bealach na Polainne" orthu. Is amhlaidh go raibh Oirthear na Prúise, an cúige ab fhaide thoir den Ghearmáin, scartha ón gcuid eile den tír ag an "mbealach" seo ó shíocháin Versailles i leith. Theastaigh uaidh freisin Saorchathair Danzig—an cathairstát neamhspleách—a chur leis an nGearmáin. De réir mar a hordaíodh dóibh, bhí nuachtáin na Gearmáine ag foilsiú scéalta uafáis faoi na hionsaithe agus na dúnmharuithe ar na Gearmánaigh áitiúla sa Pholainn agus ag éileamh ar Hitler teacht chun fortachta dóibh. San oíche idir an lá deireanach de Mhí Lúnasa agus an chéad lá de Mhí Mheán Fómhair, 1939, stáitsigh an SS "ionsaí na bPolannach" ar an stáisiún raidió i nGleiwitz (inniu: Gliwice) in aice le teorainn na Polainne. Bhí na hionsaitheoirí ag caitheamh sainéide Arm na Polainne, ach Gearmánaigh ab ea iad ar fad. Fir de chuid an SS a bhí iontu, ach thairis sin, bhí dornán fear ann ar thug na fir ón SS "cannaí stáin" orthu: cimí ó champa géibhinn ab ea iad ar gealladh dóibh go bhfaighfidís a saoirse ar ais dá nglacfaidís páirt sa stáitsiú seo. Bhí siad ag caitheamh sainéidí Polannacha freisin. Nuair a bhí an eachtra thart, áfach, maraíodh ar an toirt iad agus fágadh ina luí in aice leis an stáisiún raidió mar "chruthúnas" gurbh é Arm na Polainne a rinne an obair. Ar an chéad lá de Mhí Mheán Fómhair, d'fhógair Hitler go raibh na Gearmánaigh faoi ionsaí ag na Polannaigh agus go raibh na saighdiúirí Gearmánacha ag cosaint a dtíre dúchais anois. Ag 4.45 a chlog réamhnóna, thrasnaigh fronta leathan de dhíormaí Gearmánacha teorainn na Polainne, agus bhí an Dara Cogadh Domhanda tosaithe. Chuir na Polannaigh go fíochmhar in aghaidh an ionsaitheora, ach ar an 17ú lá de Mhí Meán Fómhair, mhairseáil na díormaí Rúiseacha isteach anoir, agus bhí port na Polannaigh seinnte. Mar a bhí socraithe roimh ré i gConradh Ribbentrop agus Molotov, dheighil Hitler agus Stailín an Pholainn eatarthu. Go gairid ina dhiaidh sin, d'ionsaigh na Rúisigh an Fhionlainn, a bhí fágtha acu sa Chonradh. Níor éirigh leis na díormaí Rúiseacha an Fhionlainn a chur faoi chois, áfach, agus is é an tátal a bhain Hitler as an scéal ná nach mbeadh mórán maithe i Stailín mar chéile comhraic. Sa bhliain 1940, chuaigh arm Hitler ó bhua go bua. D'éirigh leis an nGearmáin sraith fhada de thíortha a chur faoi chois in Iarthar na hEorpa: an Danmhairg, an Iorua, an Bheilg, an Ollainn, Lucsamburg, agus an Fhrainc. Níor thóg sé mórán ama ar Arm na Gearmáine na tíortha seo a chloí agus a fhorghabháil. Sa Ríocht Aontaithe, tháinig Winston Churchill in áit Neville Chamberlain faoi seo, agus é i bhfad ní ba déine i leith na Gearmáine ná a réamhtheachtaí. Bhí Churchill ag éileamh polasaí neamhghéilliúil in aghaidh Hitler ón mbliain 1933 i leith. Maidir le Hitler féin, bhí dearcadh sách cairdiúil aige ar Shasana ar dtús, nó bhí sé ag adhradh choilíneachas na Breataine Móire, agus é den bharúil gur chóir dó comhoibriú léi. Is é an tairiscint a thug Hitler do na Sasanaigh ná an domhan a dheighilt eatarthu: d'fhágfadh sé cead a gcinn agus a gcos acu ina nImpireacht féin, dá bhféadfadh sé an Eoraip a choinneáil aige féin. Cé nach raibh róchuma ar chás na Breataine Móire, dhiúltaigh Churchill glan oscartha d'aon chomhréiteach le Hitler. I bhfómhar na bliana 1940, rinne aerfhórsa na Gearmáine, an Luftwaffe, iarracht forlámhas spéire na Breataine Móire a bhaint de na Sasanaigh. D'éirigh ina chogadh dearg idir na Gearmánaigh agus na Sasanaigh, ach sa deireadh thiar, b'iad na Sasanaigh a ghnóthaigh an cath seo—Cath na Breataine. Ba é sin an chéad uair a briseadh aon mhórchath ar an nGearmáin sa chogadh. An plean a bhí ag Hitler trúpaí Gearmánacha a chur i dtír i ndeisceart Shasana, is é sin, "Oibríocht Seelöwe", b'éigean dó é a chur i leataobh. Ina áit sin, ghlac Hitler leis nár bhaol dó Sasana i láthair na huaire, agus chrom sé ar fhíor-chuspóir a chogaidh, is é sin, an t-ionradh soir. Ar dtús, tháinig díormaí na Gearmáine chun fortachta do Mussolini a bhí díreach ag iarraidh an Ghréig a chur faoi chois, rud nach raibh ag éirí lena chuid fórsaí. Theastaigh ó Hitler na tíortha Balcánacha go léir a fhorghabháil le taobh theas an chathéadain in aghaidh an Aontais Shóivéadaigh a choinneáil faoi smacht. Thosaigh an t-ionsaí ar an Aontas Sóivéadach—"Oibríocht Barbarossa" ar an 22ú lá de Mhí Iúil, 1941. Rinne bolscaireacht na Naitsithe idéalú ar an ionradh seo mar "chath an Iarthair in aghaidh dhorchadas na hÁise agus an Oirthir". Cuireadh béim ar leith ar chomh barbartha is a bhí na Rúisigh agus ar ról na "mBoilséiveach Giúdach" i bhforbairt an chórais Chumannaigh. Tugadh le fios, fosta, go raibh Hitler leis na Sóivéadaigh a shaoradh ó bhráca an Bhoilséiveachais, ach tríd is tríd, cogadh díothúcháin a bhí ann, an chuid is mó. Cé go raibh fórsaí armtha na Gearmáine ag comhoibriú in áiteanna le náisiúnaithe frith-Rúiseacha a raibh ag teastáil uathu a dteanga agus a gcultúr a chur chun cinn i ndiaidh dóibh saoirse a fháil ó chuingir an Aontais Shóivéadaigh, is é an plean a bhí ag Hitler na náisiúntachtaí seo a chur i ndaoirse agus an tsibhialtacht, an léamh agus an scríbhneoireacht féin a bhaint díobh sa deireadh thiar thall. Ar ndóigh, bhí Hitler meáite ar na Giúdaigh san Aontas Sóivéadach a mharú scun scan. Ar dtús, d'éirigh le Hitler go gleoite, ach i Mí na Nollag 1941, chuaigh an fórsa ionraidh in abar nuair a bhí sé ag druidim isteach le Moscó. Faoin am céanna, d'ionsaigh an tSeapáin, comhghuaillí na Gearmáine sa Chian-Oirthear, bunáit chabhlaigh na Stát Aontaithe i Haváí, Pearl Harbor, gan súil gan choinne, agus tarraingíodh na Meiriceánaigh isteach sa chogadh. Le teann dlúthpháirtíochta leis an gcomhghuaillí, d'fhógair Hitler cogadh do na Stáit Aontaithe ar an 11ú lá de Mhí na Nollag. Ar an 19ú lá de Mhí na Nollag, ghlac sé chuige féin ardcheannasaíocht na bhfórsaí armtha. D'éirigh leis an Wehrmacht cromadh ar ais ar an ionsaí sa bhliain 1942, ach ansin, i dtús na bliana 1943, briseadh an cath ar na Gearmánaigh i Stalingrad. Ba é sin an díomua ba mhó a d'éirigh don Wehrmacht go nuige sin, agus b'ansin a casadh taoide an chogaidh in aghaidh Hitler. Ba é Hitler féin ba chiontaí sa díomua seo, nó choisc sé ar na fórsaí cúlú ó Stalingrad. Mar sin, níor tharraing siad siar in am, agus an chuid acu nach bhfuair bás sa teagmháil, ghéill siad iad féin do na Rúisigh agus cimíodh iad. Sa bhliain chéanna, d'éirigh le heitleáin na gComhghuaillithe forlámhas spéire na Gearmáine a bhaint d'aerfhórsa Hitler, an Luftwaffe. Ansin, thosaigh na Sasanaigh ag buamáil chathracha na tíre ón aer, agus chuaigh éirleach agus ródach millteanach orthu. Is féidir cuid den mhilleán a chur ar Hitler, áfach, nó in áit aerárthaí éadroma trodaíochta a thógáil, bhí tionsclaíocht eitleán na Gearmáine ag táirgeadh buamadóirí troma nach raibh aon mhaith iontu leis na cathracha a chosaint. Ar an 6ú lá de Mhí an Mheithimh sa bhliain 1944, chuaigh fórsaí armtha na gComhghuaillithe i dtír sa Normandie in iarthar na Fraince. Bhí an Ghearmáin idir dhá chathéadan anois. Cé go raibh sé tuigthe ag Hitler chomh luath leis an mbliain 1943 go raibh an cogadh teipthe air, níor éirigh sé as. Mhair Arm na Gearmáine ag troid beag beann ar an drocháit ina raibh sé, agus Hitler ag áitiú ar na saighdiúirí gur náire shaolta a bheadh ann géilleadh don namhaid. Ní dhearna sé, áfach, ach líon na dtaismeach agus fulaingt na ndaoine a uasmhéidiú. Sa deireadh thiar, chinn an deachtóir lámh a chur ina bhás féin. Bhí saighdiúirí na gcomhghuaillithe Iartharacha tagtha a fhad leis an abhainn úd Elbe, agus na Rúisigh istigh i mBeirlín cheana féin. Lena chuid idéanna a chur i gcrích, bhí Hitler tar éis cogadh a chur inar cailleadh timpeall is caoga cúig mhilliún duine, fiche milliún acu san Aontas Sóivéadach. Fágadh na milliúin eile ar leathchos, ar leathlámh, ar leathshúil nó faoi léan ar dhóigh éigin eile, agus tuilleadh fós ina mbaintreacha, ina ndilleachtaí nó ina bhfánaithe nach bhféadfadh filleadh ar fhód a ndúchais choíche arís. Scoilteadh an Ghearmáin féin ina dhá leath, baineadh cuid mhór tailte di a bronnadh ar an bPolainn nó a cuireadh leis an Aontas Sóivéadach, agus ba é an tAontas sin a choinnigh leath oirthir na hEorpa faoi dhiansmacht go deireadh na n-ochtóidí. Ní raibh coimpléasc capaill ag Hitler riamh, agus ag druidim chun deiridh don chogadh ní raibh sláinte an deachtóra ach ag dul chun donais. Creidtear inniu go raibh galar Parkinson air, agus é ag éirí néaltraithe chomh maith. Mar sin féin, bhí sé in ann geasa agus draíocht a chur ar na daoine ina thimpeall i gcónaí. Ar an 19ú lá de Mhárta 1945, d'eisigh sé an t-ordú ar a dtugtar an Nerobefehl go coitianta, nó "ordú Nero"—ordú atá ainmnithe as Nero, Impire na Róimhe, faoina ndeirtear gur chuir sé an Róimh trí thine d'aon ogham. Is é an rud a d'ordaigh Hitler dá chuid trúpaí ná infreastruchtúr na Gearmáine a dhíothú de réir mar a bhí siad ag cúlú. Níor aithin sé ach an dá rogha: an bua nó an léirscrios. Ba leis na Rúisigh an todhchaí, dar le Hitler, agus ní fhéadfadh na Gearmánaigh, anois, ach stáitse na staire domhanda a fhágáil ina ndiaidh agus imeacht de dhroim an tsaoil go hiomlán. Ní raibh Albert Speer, Aire na Téisclime Cogaidh, in inmhe an t-ordú seo a scaipeadh i measc na dtrúpaí a thuilleadh, ós rud é go raibh na línte cumarsáide briste faoin am seo. Ar an 22ú lá de Mhí Aibreáin, chlis a chuid néaróga ar Hitler, nuair a bhí sé ag cardáil an tsuímh mhíleata lena fhoireann thíos sa bhuncar. Bhí sé tar éis ordú a thabhairt do Felix Steiner, ginearál de chuid an SS, teacht chun fortachta do Bheirlín lena chuid tancanna. Bhí Steiner inbharúla go raibh na cúrsaí chomh dona is nach bhféadfadh sé a leithéid a dhéanamh, agus dhiúltaigh sé glan amach an t-ordú a chomhlíonadh. Bhí Hitler suite siúráilte anois go raibh sé ligthe síos ag an SS féin, agus nach mbeadh a dhath le déanamh ach féinmharú. Cé gur áitigh Martin Bormann, Wilhelm Keitel agus Hermann Göring air Beirlín a thréigean agus an fód deireanach a sheasamh in áit éigin eile, d'fhan Hitler san áit a raibh sé. Thug sé cead do dhaoine dá fhoireann éalú ón bpríomhchathair, agus d'fhág sé faoina aide de camp, Julius Schaub, a chuid doiciméad a loscadh. I rith an chéad chúpla lá eile, ba é an t-ábhar ba mhó a bhí i mbéal na ndaoine i mbuncar an deachtóra ná cá raibh na Rúisigh faoi láthair agus conas a d'fhéadfá féinmharú a dhéanamh gan an iomarca a fhulaingt sula mbeidís anuas ort. Thug Hitler piollaí ciainíde do na daoine ina thimpeall lena chur ar a gcumas slán a fhágáil ag an saol seo go sciobtha. Ar an 29ú lá de Mhí Aibreáin 1945, dheachtaigh Hitler a thiomna polaitiúil agus shínigh sé uacht phearsanta. Ansin, phós sé a sheanleannán Eva Braun. An lá arna mhárach, bhain an bheirt acu greim as na piollaí ciainíde, ach scaoil Hitler piléar ina chloigeann sular thosaigh an nimh ag oibriú. Mar a bhí ordaithe ag Hitler roimhe sin, d'fhéach Martin Bormann in éineacht le Heinz Linge (giolla pearsanta Hitler), Otto Günsche (fear de chuid an SS a bhí ina shearbhónta míleata do Hitler), agus roinnt daoine eile de lucht freastail Hitler chuige gur cuireadh na corpáin trí thine agus gur hadhlacadh na hiarsmaí. Tháinig na saighdiúirí Sóivéadacha trasna ar na hiarsmaí ina dhiaidh sin, áfach, agus haithníodh ar na fiacla gurbh iad Hitler agus Eva Braun iad. Níor nocht na Sóivéadaigh an t-eolas seo ach i ndiaidh dheireadh an Chogaidh Fhuair, áfach. Is éard a tharla do chré na lánúine sin ná gur hadhlacadh in athuair í in aice le garastún Sóivéadach i Magdeburg. Sa bhliain 1970, áfach, chinntigh Yuri Andropov, ceannasaí na rúnseirbhíse úd KGB, gur dódh na hiarsmaí arís eile agus gur caitheadh san abhainn iad. Sebastian Haffner: Ní fhéadfá teacht ar a leithéid d'ábhar féinmharfóra. Ní spéis leis ach a fhéinspéis, agus ina huireasa sin, ní bheadh a dhath ag déanamh scime dó ná freagracht air as aon rud. Tá sé de phribhléid aige nach dtugann sé grá ach dó féin. Is cuma sa diabhal leis cinniúint na dtíortha, na ndaoine agus na bpobal. Bhí Sebastian Haffner ina scríbhneoir agus ina iriseoir, agus chaith sé blianta an chogaidh ar a sheachnadh ó Hitler i Sasana. Bhí sé cairdiúil le George Orwell ansin. Scríobh sé an nóta thuas sa bhliain 1939. Thomas Mann: In airde na spéartha mar atá sé inniu, agus é ag cur eagla ar na daoine sa bhaile is i gcéin, agus é ag baint lán a shúl as an ródach a rinne sé, as an bhfuil agus as na deora a doirteadh mar gheall air, as an éadóchas inar chuir sé na daoine agus as an oiread acu a chuir lámh ina mbásanna fein, — cé go síleann sé gur pearsa mhór stairiúil é, ní fhágfar a dhath ar bith dá chuid cainteanna ná dá chuid gníomhartha, nó ní raibh iontu riamh ach bréag gan chiall, agus ní bheidh de chlú iarbháis air ach an náire shaolta. Scríbhneoir mór Gearmánach ab ea Thomas Mann. Thuill a chuid saothar Duais Nobel na Litríochta dó. Go gairid roimh an gcogadh, chuaigh sé ar deoraíocht go Meiriceá, agus é ag labhairt go tráthrialta ar raidió bolscaireachta na gComhghuaillithe. Bhreac sé síos an méid thuas in aiste a chum sé sa bhliain 1938. Roimh an gcogadh féin, bhí grúpaí rúnda ag obair sa Ghearmáin le cur in aghaidh dheachtóireacht Hitler. Ón mbliain 1933 i leith, bhí na Cumannaigh, an grúpa úd Rote Kapelle agus iarsmaí na Sóisialaithe Daonlathacha ag iarraidh frithbheartaíocht a eagrú. Bhí daoine aonair agus grúpaí neamhpholaitiúla ann freisin agus iad ag cur in aghaidh Hitler. Sa bhliain 1942, bhí Sophie Scholl agus a deartháir Hans ag scaipeadh duilleoga bolscaireachta dá ndéantús féin timpeall ar ollscoil München. Fuair an Gestapo, póilíní rúnda na Naitsithe, amach fúthu, agus daoradh chun báis iad. Crochadh iad i bhFeabhra 1943. Is iomaí duine a d'fhéach le Hitler a mharú. Tháinig an deachtóir slán as gach iarracht, rud a chruthaigh dó, dar leis féin, go raibh sé ceaptha ag an gcinniúint féin lena chuid idéanna a chur i gcrích, agus go raibh díonadh neamhshaolta aige ar na dúnmharfóirí. Sa bhliain 1939, chuaigh an fear oibre Eilvéiseach Maurice Bavaud go München le Hitler a mharú nuair a bhí sé ag ceiliúradh an choup d'état nár éirigh leis. Níor tháinig sé chomh cóngarach do Hitler riamh is a d'fhéadfadh sé an deachtóir a mharú, áfach, ó bhí an áit róphlódaithe, agus na daoine ag ardú leathláimhe agus ag rá Heil Hitler gan stad gan staonadh, i gcruth is nach bhfaighfeadh sé aimsiú ceart ar Hitler. Sa deireadh thiar, thug sé suas an iarracht, ach tháinig an Gestapo ar a lorg agus rugadh air. Ní raibh ambasáid na hEilvéise sásta cabhrú leis, nuair a caitheadh i dtóin phríosúin é sa Ghearmáin. Cuireadh chun báis é i mBeirlín sa bhliain 1941. Sa bhliain chéanna, d'fhéach Georg Elser, fear oibre Gearmánach, le Hitler a mharú le buama i München. Phléasc an buama mar a bhí pleanáilte, ach nuair a phléasc, bhí Hitler agus lucht a fhreastail bailithe as an áit chéanna, ó bhí óráid an deachtóra ní ba ghiorra ná a shíl Elser. Mar sin, mharaigh an buama ochtar daoine, ach cé gur Naitsithe a bhí sa chuid ba mhó acu, ní raibh aon duine acu ina bhoc mór sa pháirtí. Rugadh ar Elser go gairid i ndiaidh na pléisce, agus coinníodh sa phríosún é go dtí go raibh an cogadh beagnach thart. Aon mhí amháin roimh dheireadh an chogaidh, i dtús Mhí Aibreáin 1945, mharaigh an SS é i gcampa géibhinn Dachau. Sa bhliain 1943, chuir Henning von Tresckow, ginearál de phór na n-uasal ón bPrúis, buama isteach ar bhord eitleán príobháideach an deachtóra. Theip maidhmitheoir an bhuama, áfach. Go gairid ina dhiaidh sin, thoiligh Rudolph Christoph von Gersdorff, oifigeach eile de phór na seanuasal, é féin agus Hitler a mharú le buama i mBeirlín, nuair a bheadh an deachtóir ag oscailt taispeántas na n-arm Sóivéadach a fuarthas mar chreach chogaidh ó na Rúisigh. D'imigh Hitler ón áit go róluath, agus ní bhfuair Gersdorff áiméar a bhuama a mhadhmadh. Ar an 20 Iúil 1944, rinne Claus Schenk von Stauffenberg iarracht Hitler a mharú le buama ama nuair a bhí an deachtóir ag cardáil chúrsaí an chogaidh lena chuid ginearál agus le boic mhóra an pháirtí. Tháinig Hitler slán as an bpléasc seo freisin, nó is amhlaidh nár chruinnigh na fir seo thíos i mbuncar an deachtóra mar ba ghnách, ach i mbothán adhmaid. Thíos sa bhuncar, mharódh tonn bhrú an bhuama gach mac máthar acu, ach ní raibh an phléasc leath chomh dainséarach i mbothán adhmaid ar ghéill a bhallaí don bhrú. Mar sin, fágadh Hitler beo beathaíoch, agus d'agair sé díoltas uafásach ar lucht na comhcheilge. Básaíodh Stauffenberg beagnach ar an toirt, agus céasadh an chuid eile acu chun báis trí iad a chrochadh ar bhacáin iarainn an bhúistéara. Bhí baint ag Gersdorff agus Tresckow leis an gcomhcheilg chéanna, agus mharaigh Tresckow é féin sa Pholainn nuair a chuala sé go raibh an iarracht teipthe. Tháinig Gersdorff slán as an gcogadh, iontas na n-iontas, ach cé go raibh sé ina thogha oifigigh, níor fháiltigh an Bundeswehr isteach é riamh i ndiaidh an chogaidh, ó bhí na hiar-oifigigh Naitsíocha chomh láidir san arm i gcónaí is gur éirigh leo é a chur ó dhoras. B'iad cúrsaí an charthanais ba mhó a bhí ar intinn Gersdorff ina dhiaidh sin, nó bhí sé ar duine acu siúd a bhunaigh craobh Ghearmánach de Chumann Naomh Eoin, is é sin, cumann na n-otharcharranna. ↑ www.ucd.ie/centenaries (2016). "DEICH mBLIANA na gCUIMHNEACHÁN". Dáta rochtana: 29 Iúil 2018. ↑ Hugh Trevor Roper a chuir in eagar. 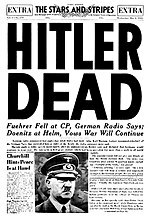 "Hitler’s Table Talk 1941-1944" Phoenix Press (2002). Tugadh an leathanach seo cothrom le dáta an 2 Márta 2019 ag 23:43.